I hope you're enjoying the weekend. The Daylight Savings time switch is once again kicking our butts over here, with Henry up at 4 a.m. instead of his usual 5 a.m. Yawn... 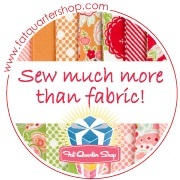 It is also gross and rainy outside, so we're looking at a Sunday at home, and I need to fish something out of my bag of crafty tricks. Maybe we'll do some collage or painting, or maybe bake some cookies! That actually sounds pretty good! How about you? 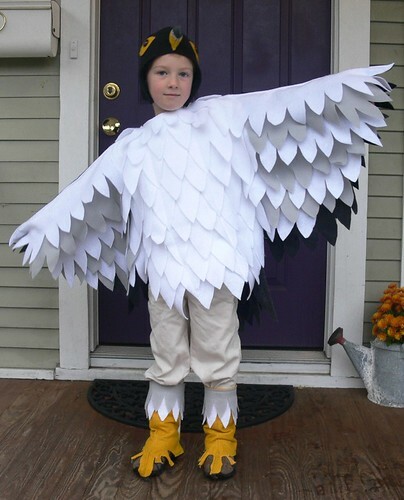 I wanted to show you Ben's finished Halloween costume. I got it done on Tuesday evening, and while it was slightly last minute, it came together pretty well. Ben wore it to school on Wednesday morning for the school Halloween party and was so proud of himself! I changed my plans a bit after my original sketches. I ended up creating more of a poncho for the wings and body of the falcon, rather than a shell and separate wings attached to the arms. We also skipped painting spots on the front of the body. 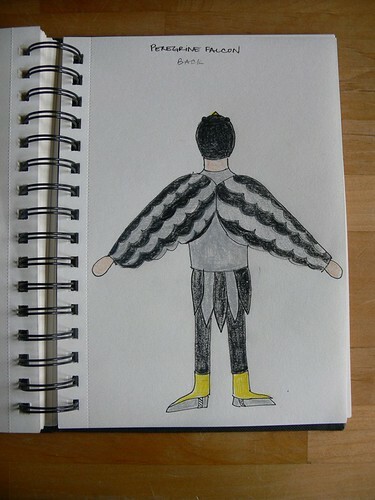 With the thick layers of felt feathers, the poncho at first made Ben look like a big fluffy chicken. 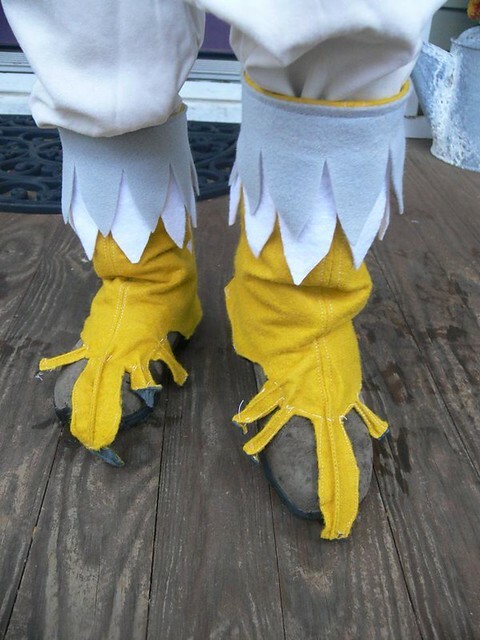 So I sewed the wing layers together with horizontal lines under the feathers, from the tip/edge to where the torso would be. This made the wings flat aside from a "tunnel" for each arm to slide through. That fixed the issue! For the "helmet", I copied the shape and size of a winter hat, then added a few pin-tucks (is that the correct term?) until the fit was as good as it was going to get. 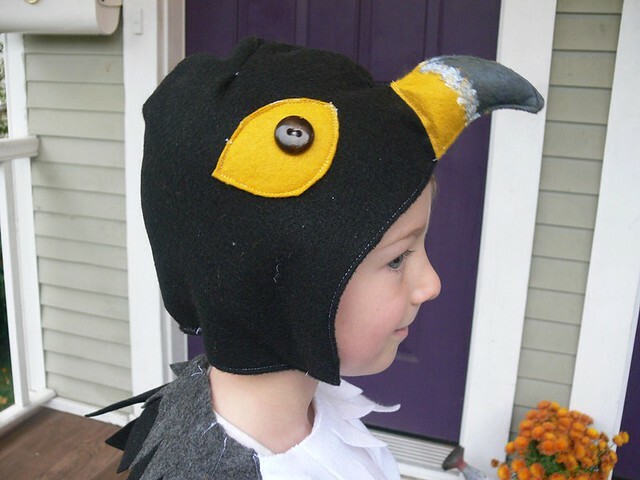 The beak is filled with a little polyfill and painted with grey and white fabric paint. There's elastic under the chin to keep it in place. Next time, I would line the inside with a soft cotton -- Ben was a trooper and kept his helmet on the entire day but complained of itchiness. The claws were quite tricky to make. 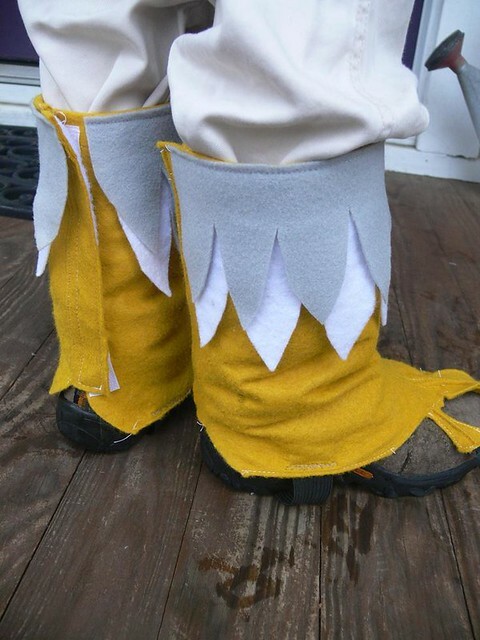 I copied some firefighter boots from an old homemade costume, enlarged them and cut out claws that I top-stitched down the middle and at the end to give them a 3-dimensional quality. I painted the "nails" with black fabric paint. From far away, I think they actually looked like claws, but from up close, eek. Overall I am pretty pleased with how it turned out! I have definitely learned some aspects of apparel and costume construction since last year, and am proud of how this costume turned out. It is always such fun to deliver a successful execution of your kid's vision. Ben was thrilled! Part 2 - Who's Ready for Halloween? I hope that helps! Don't hesitate to leave me a comment with questions. I love how the costume came out, really fun for him and something original. 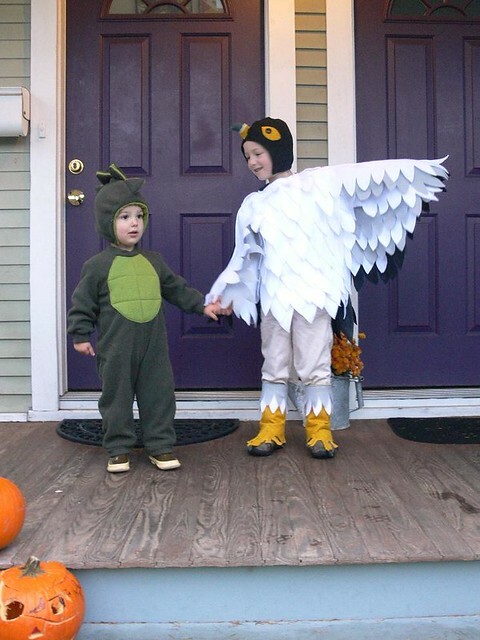 My kids are all grown up, so no costumes here. I really like how you accomplished the wing effect, and I think they turned out well! Oh wow it turned out awesome, your sons are so lucky to have such a talented and ambitious mom. This costume was AMAZING in person! There was so much detail involved. Great job! 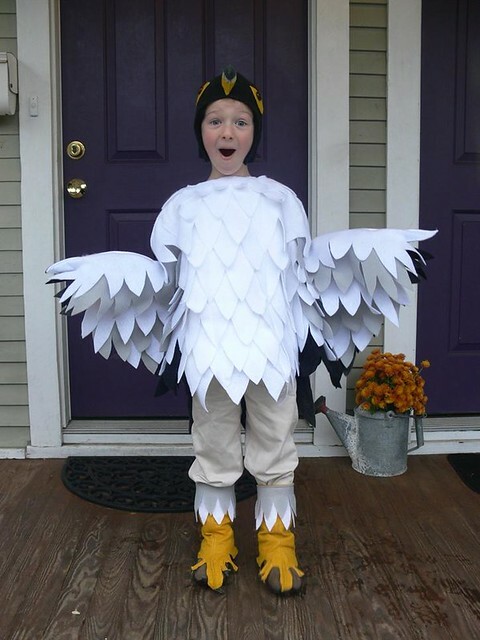 What a fantastic costume! 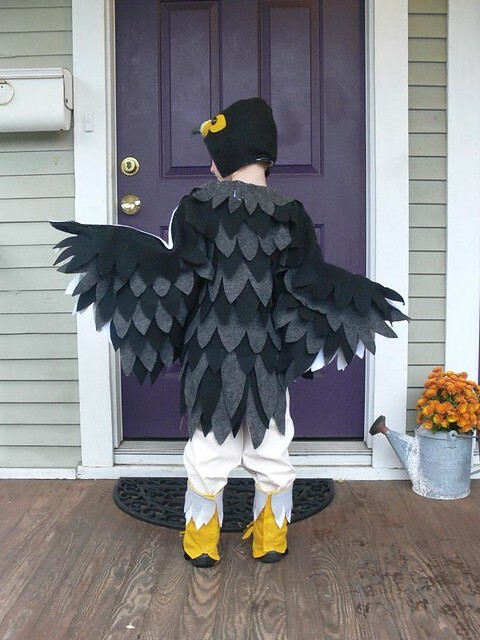 My little guy is obsessed with peregrine falcons and he too wants to be one for Halloween. 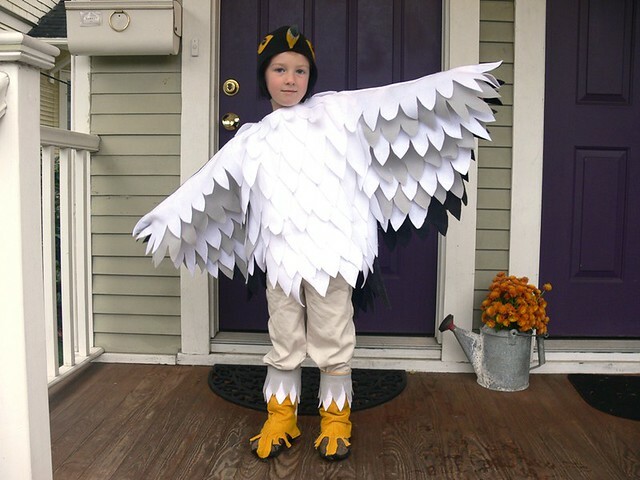 Are you currently making this costume to sell? 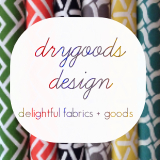 I could attempt this on my own, if I found my sewing machine power cord, but have no idea the amount of fabric. 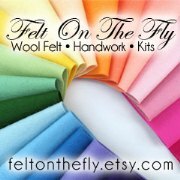 If you aren't selling would you share fabric measurements? Thank you! Karen and Beth, thank you for your enthusiastic comments. Unfortunately, I do not make costumes to sell. 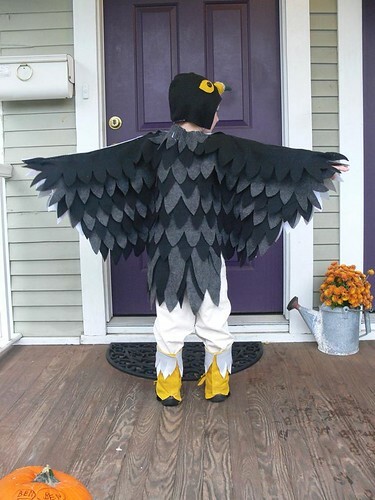 You can find out more info about the process of making this costume on my two previous posts here: http://stumblesandstitches.blogspot.com/2012/10/halloween-prep-peregrine-falcon.html and here: http://stumblesandstitches.blogspot.com/2012/10/whos-ready-for-halloween.html. Let me know if you have any questions! Do you have any recollection of how many yards you used?? Outstanding job, your blog was really helpful. 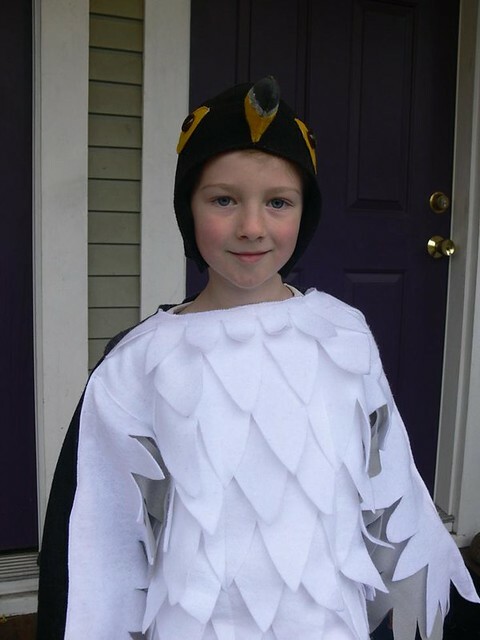 My son is going to be a peregrine falcon this year, thanks to you! Thank you! This is amazing!!! I am seriously impressed! Nice work! 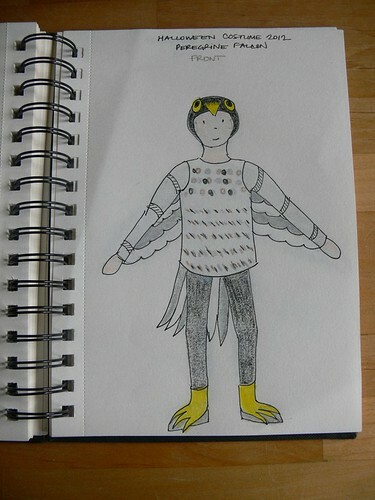 You look like a falcon all right!